Description:We have been doing the following circuit for a while now and try to fit it into every referee training session. It has changed a bit with use but this is it’s current format. Each station runs for 60 seconds with a 15 second break in between. Trainer can easily join in.Mark out a square on the floor with the corners exactly ten feet apart. These are the ‘corners’ and are marked as ‘C’ on the diagram. Mark the points of an imaginary triangle laid on opposite sides of the square approx 5 feet out, these are the ‘points’ which are marked ‘P’. The activities at the corners should be a good mix of cardio and strength training. By the time refs get to P1/2 they should be a bit puffed and have to work to switch into ref brain mode. 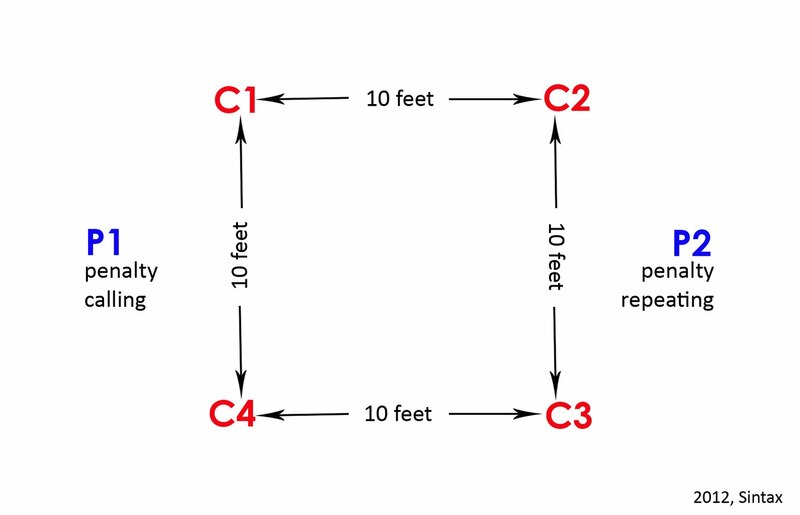 Each activity should be done with the participants’ hips directly over the ‘C’ mark on the floor. Set a different activity for each corner and remember to discuss alternatives with anyone who is injured/off-skates. Suggested activities include: stutter steps/running on the spot on toe stops; isometric squats; planks; sit-ups/push-ups; alternating knee-lifts; anything you can do on-skates, in one place, which will get your pulse up.